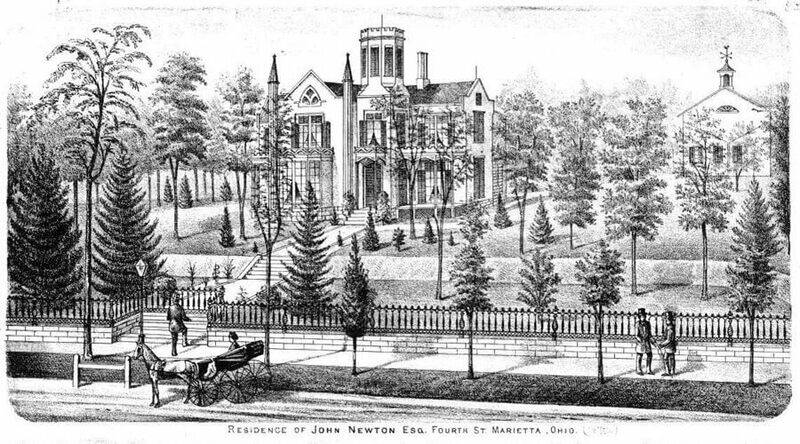 The Castle was the home of some of Marietta’s most prominent and influential citizens. The property was leased as early as 1808 by a potter and his family, making it one of the earliest pottery manufacturing sites in the entire Northwest Territory. The Gothic Revival house was built in 1855 for $10,000 (equivalent to roughly $275,000 today) and a carriage house was completed just three years later. The Castle was the site of grand business, community, and family functions throughout its history. Only five families have lived on the property between 1808 and 1974. These residents included lawyers, bankers, land and oil speculators, and a President Pro Tem of the Ohio Senate. Upon the death of its last resident, Jessie (Davis) Lindsay, the property was purchased at auction by Bertlyn and Stewart Bosley in 1974. The brother and sister spent the next seventeen years renovating and restoring the house, but never resided at The Castle. Upon their deaths, the entire property was then donated to the Betsey Mills Corporation, who completed the final repairs. The Castle opened for tours as a historical house museum in 1994. At that time, The Castle was initially furnished with antiques from the Bosleys, as well as donations of historical furniture from other Marietta families. Since that opening, however, a number of items relating to the various owners of The Castle have been donated to the museum and are now on display. Besides museum tours, our mission of providing educational and cultural offerings includes school and scout programs, history and archaeology summer camps, cemetery and historically-themed programs, cultural bus trips, and much more. Today we honor the legacy of The Castle families and our historical buildings while providing individuals and families with an opportunity to learn of our town’s connection to significant local, state, and national events.